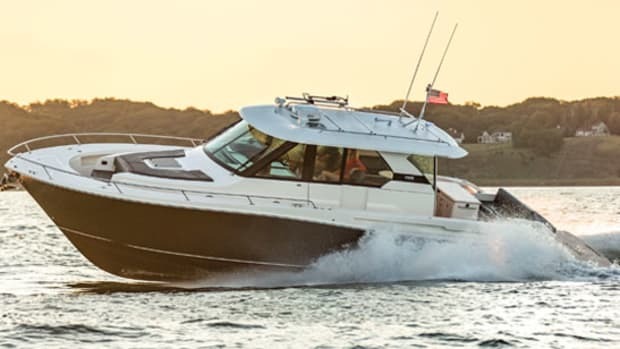 The Tiara F53 Flybridge updates the Holland, Michigan-based builder’s line without sacrificing its brand DNA. Seasickness can be a spoiler for boaters, especially if they have a family member or friend who can’t tolerate even the slightest swell offshore. 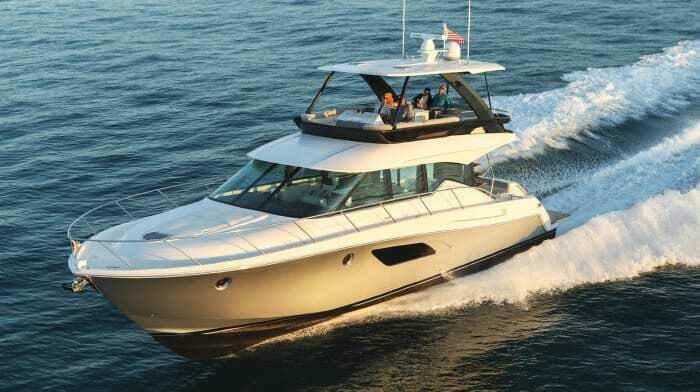 So, when Tiara Yachts of Holland, Michigan, set out to replace its 50 Flybridge with an updated model, the builder decided to offer the boat with an optional Seakeeper to further enhance comfort at sea. 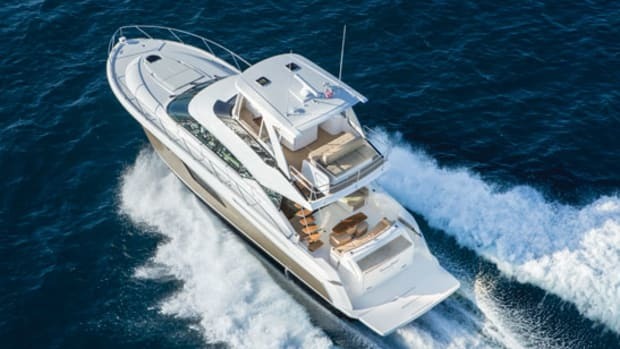 This was a major contributing factor to the design of the new Tiara F53 Flybridge, which houses an optional Seakeeper 9 Gyro in the forward part of its engine room. “The decision to grow the boat from 50 to 53 feet stemmed from the desire to seat the Seakeeper in a dedicated spot,” said David Glenn, marketing director of Tiara’s parent company, S2 Yachts. The Tiara design team extended the hull’s running surface by 30 inches in order to compensate for the Seakeeper’s added weight and to maintain the boat’s bluewater performance, he explained. The hull extension also provided more technical space aft for big-boat systems like a lazarette large enough to hold dive tanks and a fully retractable shore-power cable. Another challenge for some boat owners, particularly those new to the sport, is docking in tight quarters. There’s good news for them: Tiara has partnered with Volvo Penta to equip many of its models with highly maneuverable IPS propulsion systems. 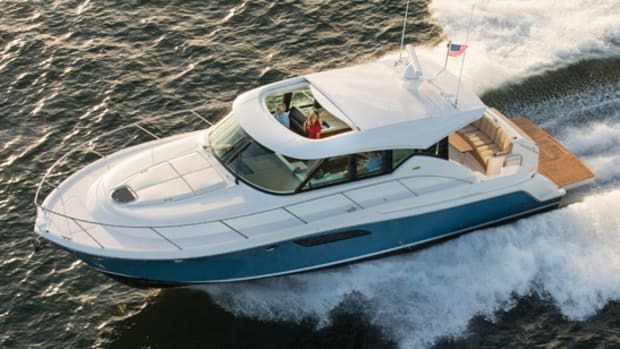 Both the new F53 Flybridge and its sister yacht, the C53 Coupe—with which it shares a hull—are designed to run with twin 725-horsepower Volvo IPS950 diesel engines/pod drives and Volvo’s innovative Joystick Plus control. To make docking even easier, our test boat featured an optional Volvo Joystick Plus control mounted on the aft deck’s starboard-side wing. Watching Glenn slide the boat into a slip using that wing station was impressive. 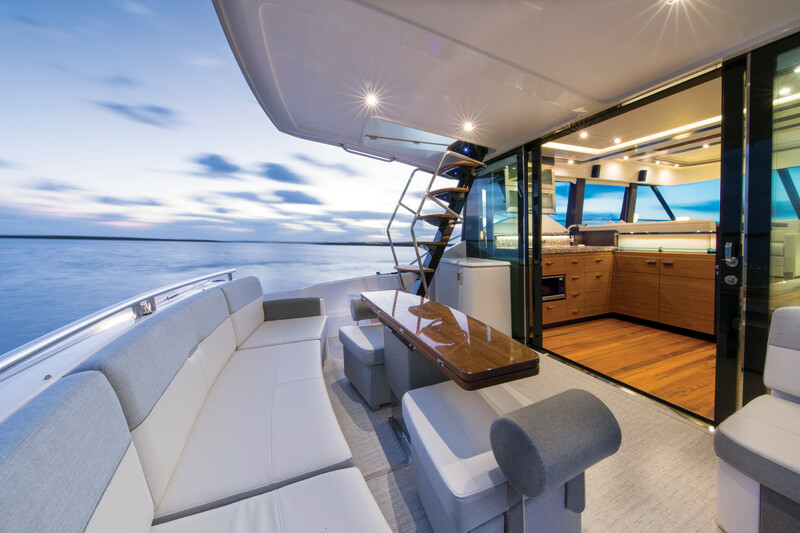 From the sunpads flanking the helm on the flybridge to the moveable furniture in the cockpit, social spaces are well planned on the 53. 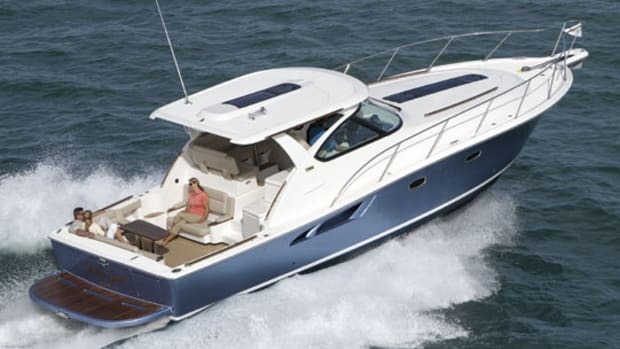 The F53’s flybridge is completely covered by a large hardtop with two Bomar hatches. 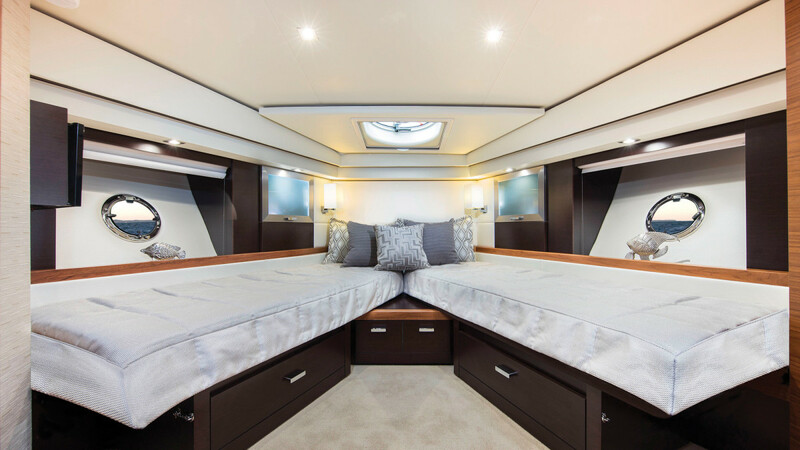 The optional clear enclosure, manufactured and seamlessly fitted by Ranier, protected us from the elements on all four sides, creating an enclosed helm/lounge area cooled by the optional 28,000-Btu flybridge air-conditioning system. Large L-shaped lounges on either side of the helm and a U-shaped settee with hi-lo dining table aft make this deck an ideal space for the crew to gather, served by a central galley console equipped with fridge, sink, cutting board, and stowage (an ice maker is optional). 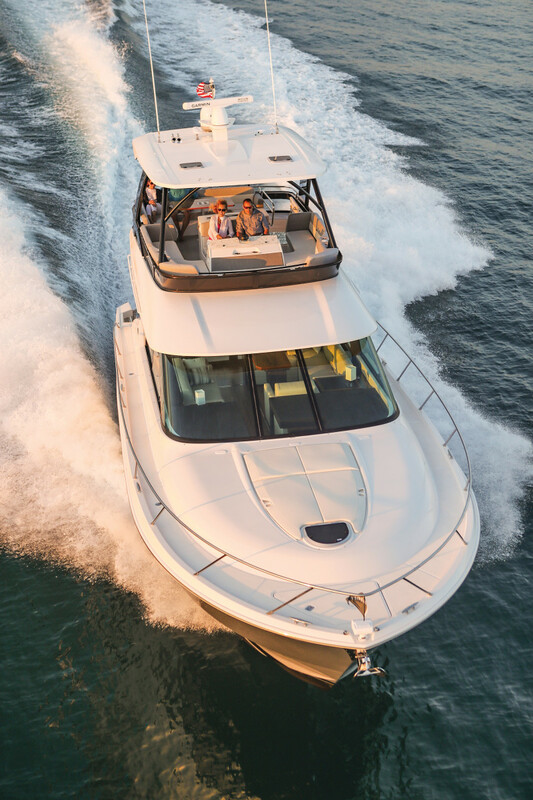 The flybridge’s functionality as a party platform is only surpassed by the fun of driving the boat from up here. The view from the helm, with or without the clear enclosure in place, is outstanding. So is the Glass Cockpit electronics module, the result of a joint venture that combines Volvo Penta engine controls with two bright 16-inch Garmin MFDs. The double helm seat has an electric slide control, just like a car, so you can adjust it to suit your driving style. The main Joystick Plus control is conveniently located on the armrest between the driver and passenger seats. When it’s time for slow-speed maneuvers, you just set the throttles at 600 rpm and twist the top of the joystick to rotate the boat in the desired direction, or gently push the control port or starboard to “walk” the boat sideways. Our test F53 also was equipped with Volvo’s Dynamic Positioning System, linked to a button on the joystick’s knob. This GPS-enabled feature can be a true joy when you are waiting for a bridge to open, as it keeps the boat on station. Tiara’s engineers put a convenient touchpad control for the F53’s standard Garmin navigation suite on the center armrest as well. 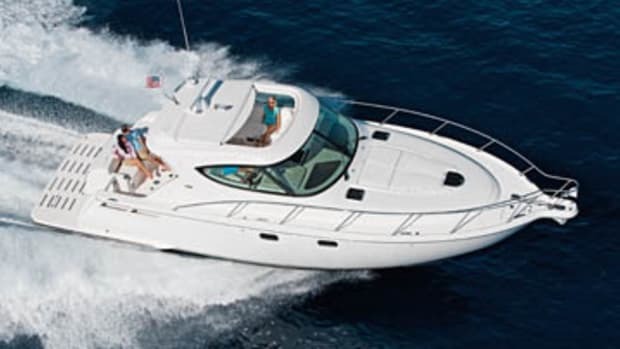 My pleasurable driving experience got even better when I opened up the boat’s throttles on the wide St. Lucie River. The six-cylinder Volvo Penta D11B2-A MP engines are turbocharged and supercharged, so there was no lag in acceleration time, and the boat planed at about 1800 rpm with hardly any bow rise. 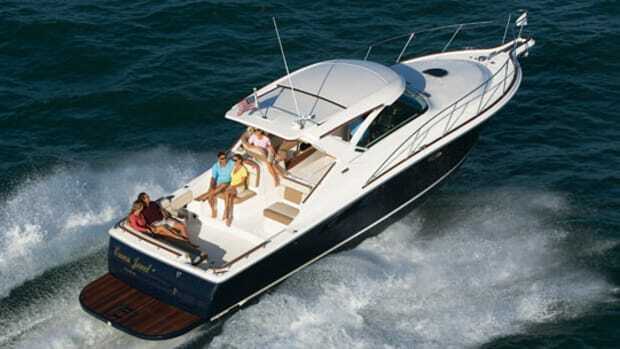 Optimal cruise speed for the F53 is about 28 knots at 2200 rpm, and wide-open throttle is 38-plus knots at around 2500 rpm. The river was too calm to use the Seakeeper stabilizer during my sea trial, but the V-hull cut through the few wakes and chop we hit quite nicely. I could have used the steering wheel when driving at speed, but with Joystick Plus, I didn’t have to. I just set the throttles and kept steering the boat with the joystick, which makes cranking tight turns an effortless maneuver. Tiara Yachts also offers a version of the F53 with conventional power, but I’m willing to bet most owners will choose IPSII. A wall of glass provides a feeling of continuity between the cockpit and saloon. 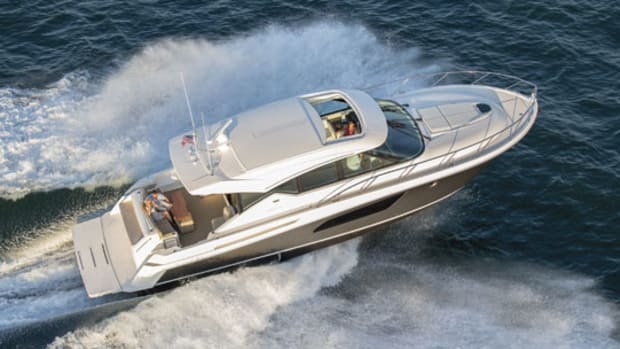 The Tiara F53 sports a contemporary exterior design that disguises the boat’s true size: The open flybridge with its narrow, curved struts, the continuous wraparound saloon windows, and the gently sloping sheerline all make it look sleek and slim as it runs through the water. But when you tour the boat’s accommodations, the extra volume produced by its wide beam and high coach roof becomes apparent. While the flybridge is large for a 53-foot yacht, the spacious main deck is even more impressive. To begin with, there’s a 70-inch-deep swim step (you can upgrade to a hydraulic platform) and a big transom stowage hatch with a Corian countertop. Instead of putting the optional electric barbecue grill on the flybridge, Tiara’s design team cleverly hid it inside this hatch. “You can grill your catch right out of the water,” Glenn said. The aft deck has a settee and convertible cocktail/dining table with two pull-out ottomans that expand the seating capacity for eating alfresco. You can open the aft sliding doors to the saloon all the way to merge the indoor and outdoor spaces and create one long, continuous platform for living and entertaining. 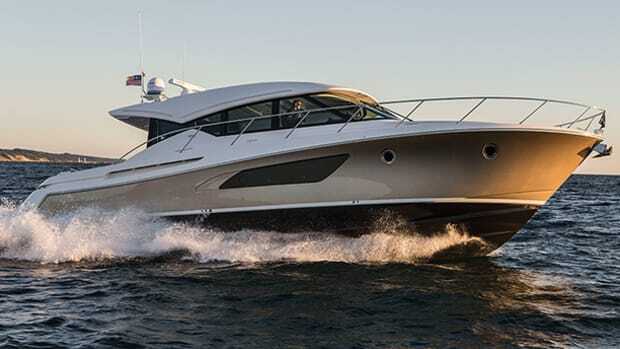 Tiara introduced its aft galley on the C53 Coupe several years ago, and the concept has proved so popular that the design team incorporated it into the F53’s main-deck layout. 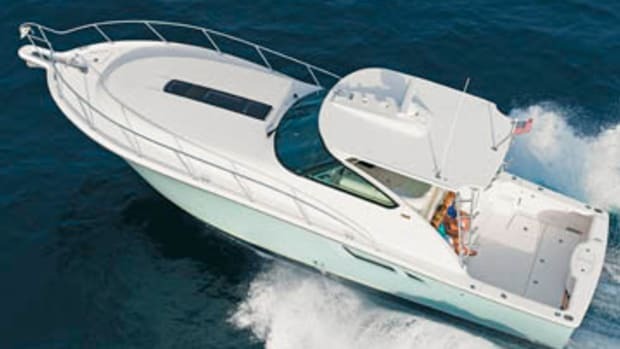 Equipped with a sink, three-burner cooktop, microwave/convection oven, and under-counter refrigerator and freezer drawers, the galley is ideally located to serve both the aft deck and saloon dining areas. Forward, the saloon is two steps up, where guests can take full advantage of the continuous views seen through the large side windows and windshield. The boat comes with a 40-inch saloon LCD TV, but it’s on a hi-lo mount so it won’t obstruct a window when you’re not watching it. Our test boat did not have a lower helm, but Tiara will add one in the forward starboard corner if an owner requests it. 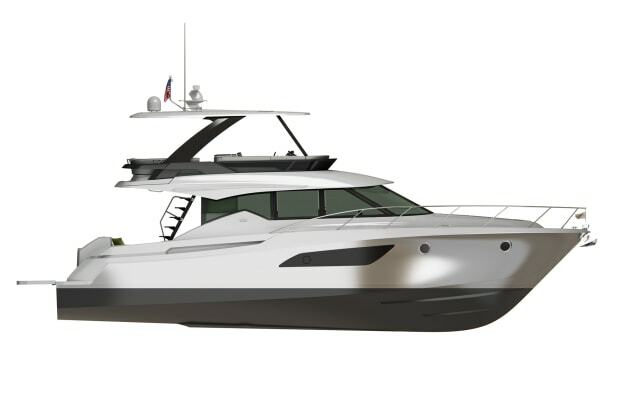 Glenn describes the F53’s interior design theme as “modern elegance.” It’s the attractive result of the builder’s mission to update its 50-foot cruiser model with contemporary equipment, fixtures, fabrics, finishes, and woods, while at the same time maintaining its brand DNA. The athwartships, amidship master makes the most of the space. The wide-open main-deck sightlines extend all the way from the aft deck to the forward stateroom, which is a few steps down in the bow. 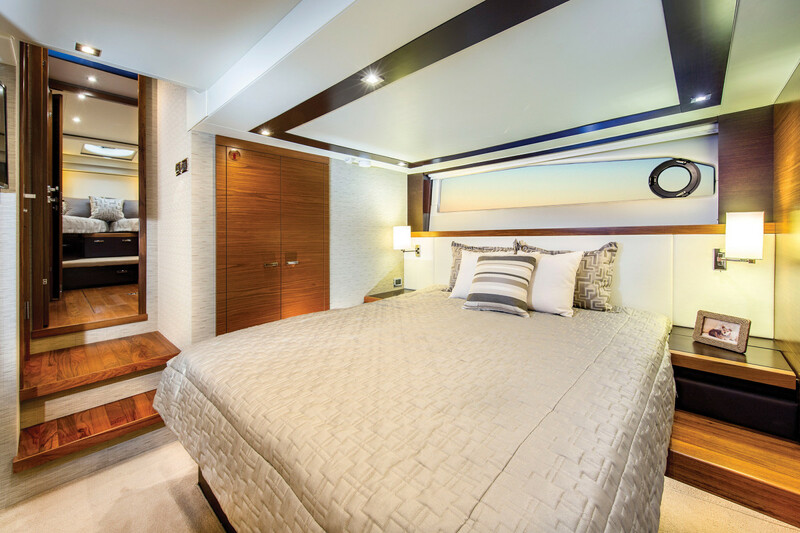 At first glance, this VIP cabin with its split twin berths looks like a throwback to the old sailboat V-berth arrangement, but on the Tiara, you can slide the berths together and fasten them to form a queen. There is a private door to the adjoining head with large teak-lined shower stall. The head also opens to the corridor so other guests may access it. The F53’s standard lower-deck layout calls for two staterooms with a washer/dryer between them. Our test boat, however, showcased the optional three-stateroom layout, which substitutes a cabin with twin bunks for the pantry and relocates the washer/dryer to a cabinet in the master. The bunkroom is perfect for a couple of kids. By lowering the master stateroom three steps and raising the saloon floor above it, the Tiara design team created 6 feet 2½ inches of headroom in the cabin’s entry. There’s nearly 6 feet of headroom over the athwartships queen berth, which has voluminous stowage beneath it. Large hull windows inset with opening ports bring in plenty of light. The master head also gets light from a window—although you can mask it with privacy blinds. 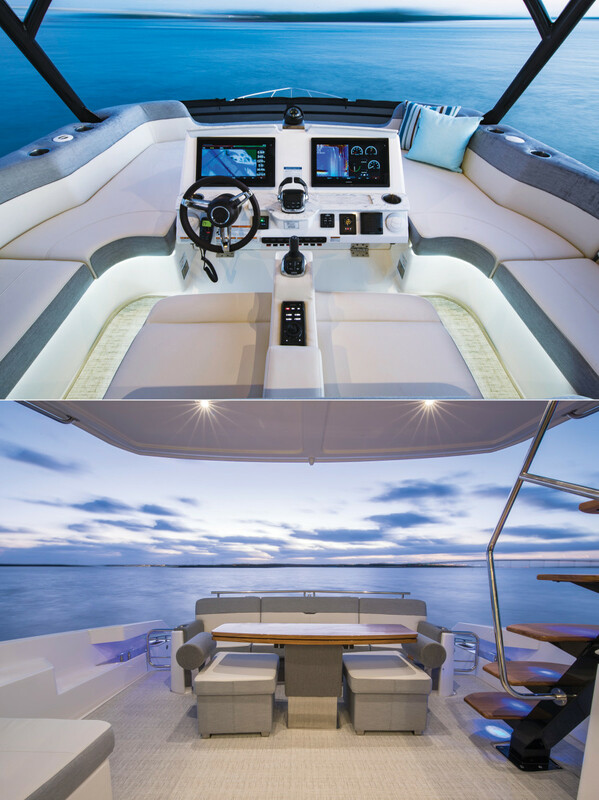 The interior décor throughout the new F53 is a blend of classic and contemporary, which is sure to help the boat retain its value in years to come. But it’s Tiara’s solid fiberglass construction, electrical wiring, and safety features that give the F53 enduring value. For example, the design team put the breaker panel inside a settee in the saloon so it wouldn’t obstruct a window. You have to bend over to use the panel, but once you’ve preset the switches, you can control everything from the battery station conveniently housed in a galley cabinet. Similarly, the modern-style ladder from the aft deck to the flybridge looks a bit tenuous, mounted on a single pole, but once you start climbing it, you find that the teak treads are wide and the handrails high, ensuring your safety and comfort. The boat’s walkarounds also are protected by a high side rail. 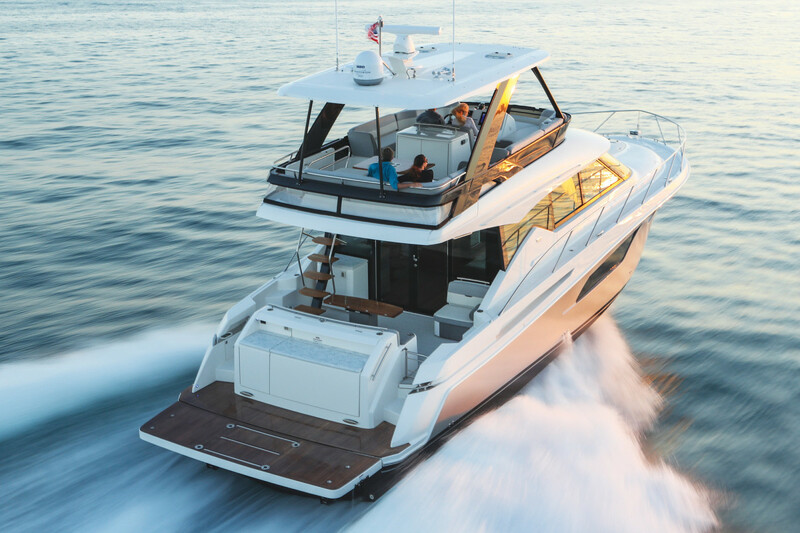 Speedy yet seaworthy, sleek yet safe, the new F53 Flybridge successfully blends Tiara Yachts’ years of experience with the easy operation, high-tech features and comfortable luxury that boaters demand today. Scissor berths in the forward VIP offers owners—and their guests—options. Performance report supplied by Tiara Yachts.